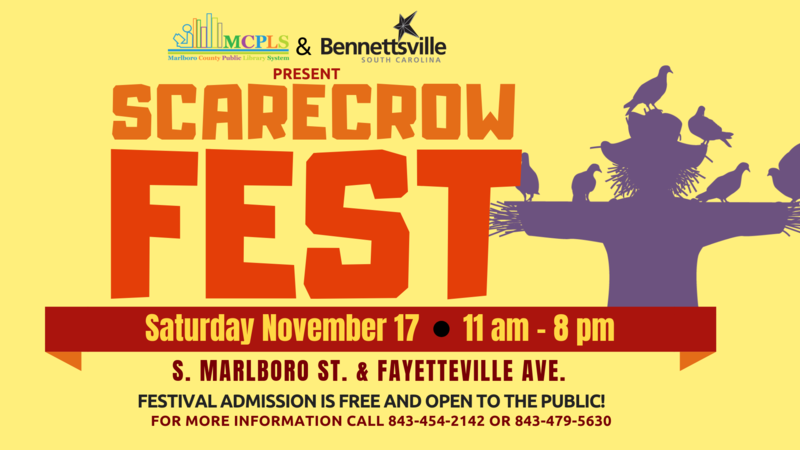 S. Marlboro Street & Fayetteville Ave.
Join the Marian Wright Edelman Public Library of Marlboro County and Visit Bennettsville SC as we host Scarecrow Fest! This one day festival will have something for everyone to enjoy including: live music & performances, inflatables, hay rides, games, food vendors, face painting, craft vendors, and a FUNd Run to benefit the Friends of the Marian Wright Edelman Public Library. To register for the FUNd Run visit jonesracingcompany.com. 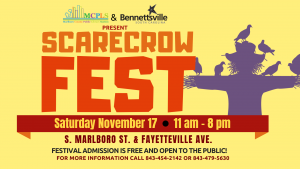 If you are interested in participating in Scarecrow Fest as a vendor or sponsor contact the Marian Wright Edelman Public Library at 843-479-5630 or the City of Bennettsville Department of Tourism, Parks and Recreation at 843-454-2142.